Minto Group Inc. - Growing in Harmony — two new locations to talk about! Growing in Harmony — two new locations to talk about! 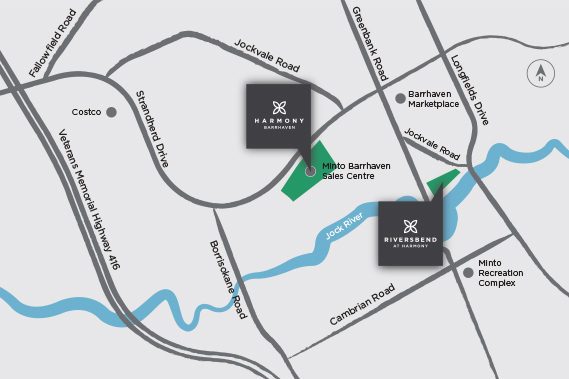 Find Harmony in Barrhaven — this time with two great new locations to choose from! Harmony Phase Two is now on sale with more Single Family Homes and Townhomes! This new stage of Harmony is located along Strandherd Drive in close proximity to the French school coming soon to the community, and all you need in the heart of Barrhaven. Or, choose to live in the new, unique collection of Executive Townhomes in Riversbend at Harmony! Situated in the quiet bend of the Jock River in Barrhaven, Executive Townhomes are coming soon to this green space hidden away just around the corner from Harmony between Greenbank Road and Longfields Drive. Sign up to receive news and announcements about the two new locations, Phase Two and Riversbend at Harmony! This hidden green space in the heart of Barrhaven is your connection to the great outdoors. Keep urban life close at hand while embracing the tranquility of a neighbourhood steeped in nature. 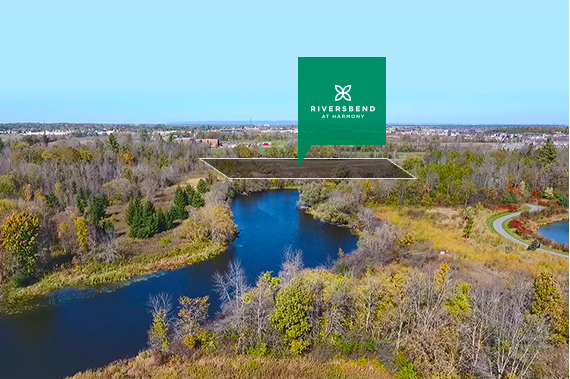 Riversbend is nestled between two major roads, yet is protected by a blanket of lush greenery, mature trees, and, of course, the Jock River to the south. Walk the quiet, inviting streets of the neighbourhood — you’re in a secluded green space that feels as though it could be minutes or hours away from the city. If you’re looking for even more green spaces outside of the community, there are three to choose from, each just a short walk away! Head south from Riversbend across the river to Half Moon Bay District Park. A winding path cuts a loop around a large pond, with several lookout points, and connects to Greenbank Road and the nearby Minto Recreation Complex. East of Riversbend, you’ll find the starting point of Stonebridge Trail. Walk, jog, or bike down this extensive, 5km long network of paths and trails complete with beautifully scenic views along the Jock River. Pass multiple sports fields as you make your way into a dense, tree-covered walkway that runs parallel to the river. Walk north towards Chapman Mills for yet another natural, green space with a large pond system waiting to be explored. Looking for more great reasons to live in Barrhaven? Here are seven! With an abundance of nearby amenities, Harmony is close to everything you need, including shopping, dining and plenty of greenspace.